Republicans on the House Oversight and Government Reform Committee decried official time, the practice where federal agencies compensate union employees for representational work, as a waste of taxpayer dollars that “subsidize” federal employee groups’ internal and political work. But Democrats at the hearing, titled Union Time on the People's Dime, which featured no witnesses from federal employee groups, accused the committee of devising a “union bashing” session and said GOP lawmakers’ assertions were based on faulty numbers and ignore the many benefits of official time. Ahead of the hearing, committee staff released a memo on federal agencies’ use of official time, which concluded that in fiscal 2017, “total compensation of all federal employees using any official time was $1 billion.” That figure was vastly higher than one in a recently released report from the Office of Personnel Management, which estimated that the cost of compensation for hours spent on official time in fiscal 2016 was around $174.8 million. Republicans also decried the number of federal employees who worked “full-time” on official time, which some agencies consider to be at least 50 percent of a fed’s work day while others interpret it to mean 100 percent of their time. The report states that in fiscal 2017, 981 employees spent at least 50 percent of their time on official time, and of them, 221 earned at least $100,000 per year. Committee Democrats, who said they were not consulted on the GOP report, issued their own memo, calling its findings “fundamentally flawed.” They wrote that the $1 billion figure is intentionally deceptive, and said Republicans are vastly overstating the number of federal union members who spend at least a majority of their workday on official time. At the hearing, Trey Kovacs, a policy analyst with the conservative Competitive Enterprise Institute, argued that official time is a flawed policy that is ripe for abuse and diverts agency resources from its stated mission. 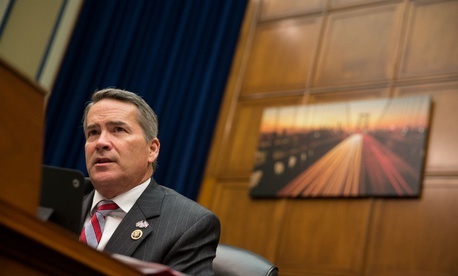 Rep. Jody Hice, R-Ga., who has previously introduced legislation to reduce the pensions of some employees who use official time, said federal employees should be doing the job they were hired for, not union-related work. Darrell West, vice president and director of governance studies at the Brookings Institution was the sole witness who supported the practice of official time. He noted that in exchange for compensating employees for official time, agencies receive a number of benefits. One principle for which there was bipartisan support was improving how the federal government tracks the use of official time. But while Republicans were focused on tracking only the financial cost of the practice, West and committee Democrats wanted something more akin to a cost-benefit analysis. Rep. Gerry Connolly, D-Va., accused committee leadership of creating a hearing that is not actually interested in improving official time or how OPM reports on the issue. In statements, federal union officials condemned the hearing and the Republican staff memo’s suggestion that official time representational work does not contribute to agencies’ missions. The American Federation of Government Employees said in a statement that not only does official time not impede agency operations, it often improves them.